So the humble postcard is back in fashion having survived the internet age, emails and e-cards. This month Royal Mail announced soaring sales of postcards with 135 million being sent last year – an increase of 30 million on five years ago. According to an article in The Guardian today, the postcard boom began around 1900, thanks to two developments- improved printing methods combined with reduced postal charges – and 419 million were sent that year. This had doubled by 1918. Mostly, then as now, people sent cards from their holidays. Proof that they were there, showing off their good times. It’s become an inherited tradition. 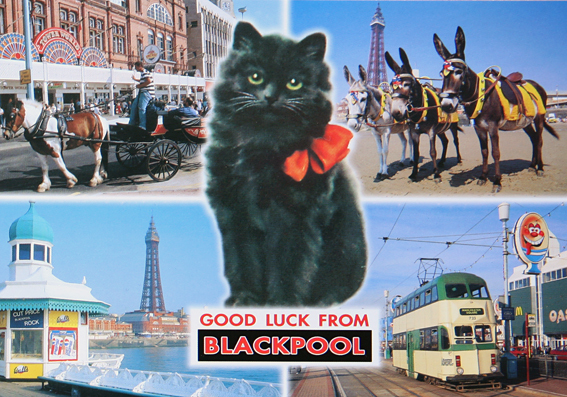 Blackpool, the popular coastal resort in Lancashire, has had a rich association with the postcard. Mainly thanks to Donald McGill a graphic artist (and respectable Victorian gentleman) who created the smutty postcards sold mainly in small shops in British seaside towns. Between 1904-1962 McGill produced an estimated 12,000 designs of which an estimated 200 million were printed and sold. In 1939, one million were sold by one Blackpool shop alone! His postcards even came under the scrutiny of the Conservative government in the 1950s. Here are a few contemporary postcards I came across in Blackpool this weekend (along with a potted history of the town’s attraction as a tourist destination). The growth of Blackpool is best understood in the context of conditions in the industrial North of England and with contemporaneous developments in communications. 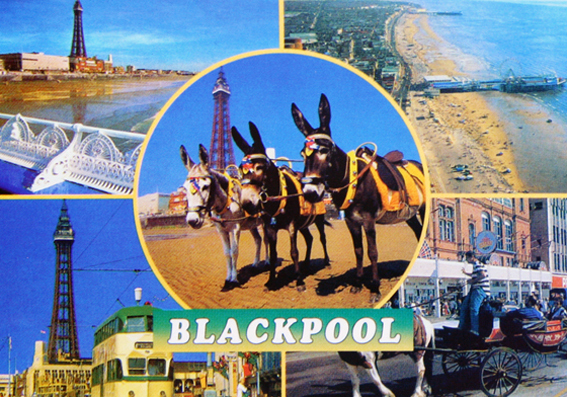 The history of Blackpool has been largely determined by its geographical position in relation to the heavily populated towns and cities of Lancashire, and by the rapid changes in transportation and economic conditions that took place there. The city began attracting holiday visitors in 1735, when the first guest house opened. However it was when the railway arrived, in 1846, that holidaymakers began to arrive in their thousands. There was a practice among the mill owners of Lancashire towns to close the factories for a period every year to service and repair machinery. These became known as “wakes Weeks”. It is interesting to note that these holidays were not principally intended to give the workers a rest but were mainly to service the equipment. Time off work together with cheap and convenient travel led to large numbers of visitors taking their holidays outside the towns they lived in. Each town would have a different wakes week during which almost the entire population would board the trains and decamp to the coastal resorts of Morecambe, Southport, and of course, Blackpool. 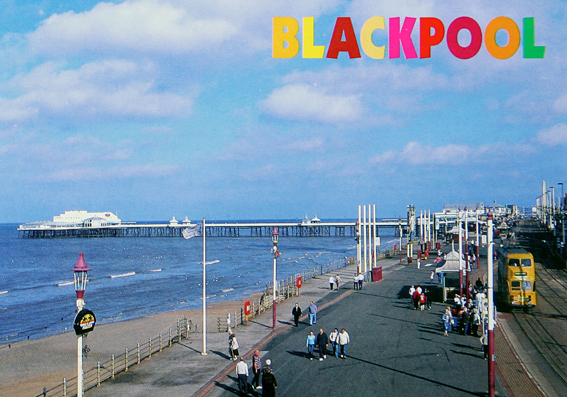 From the 19th century, Blackpool became a popular working-class destination and it grew at a phenomenal rate. In 1881 it had a population of 14,000. By 1901 the population was 47,000. By 1951 it had grown to 147,000. 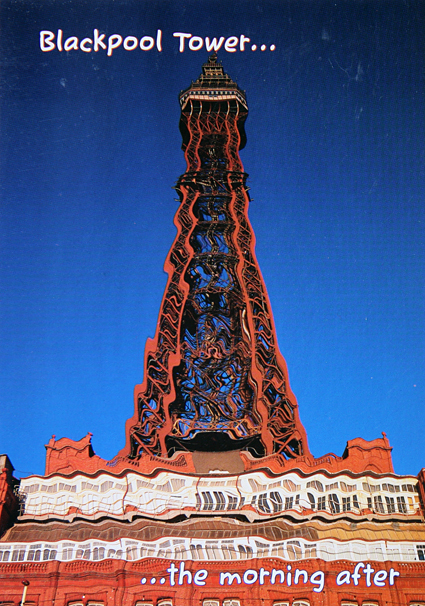 Blackpool is famous for its tower, which was built between 1891 and 1894. However, much of Blackpool’s growth and character from the 1870s on was predicated on the town’s pioneering use of electrical power. In 1879, it became the first municipality in the world to have electric street lighting, as large parts of the promenade were wired. The lighting and its accompanying pageants reinforced Blackpool’s status as the North’s most prominent holiday resort. It was the forerunner of the present-day Blackpool Illuminations. Another major development came when the post-war Labour government introduced paid annual holidays for all employees, boosting tourism in the resort. 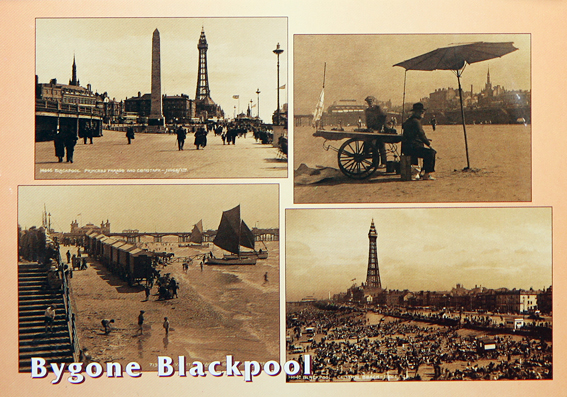 The inter-war period saw Blackpool attain pre-eminence as a holiday destination. 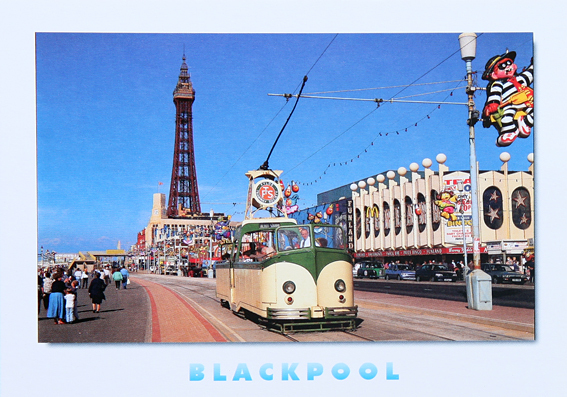 By 1930, Blackpool claimed around seven million visitors per year, three times as many as its nearest British rivals, still drawn largely from the mill towns of East Lancashire and West Yorkshire. Blackpool was spared serious damage during World War II and in the decade afterwards, it continued to attract more visitors, reaching a zenith of 17 million per year. However, several factors combined to make this growth untenable. The decline of the textile industry led to a de-emphasis of the traditional week-long break. The rise of package holidays sent many of Blackpool’s traditional visitors abroad, where the weather was more reliably warm and dry, and improved road communications, epitomized by the construction of the M55 Motorway in 1975, made Blackpool more feasible as a day trip rather than an overnight stay. 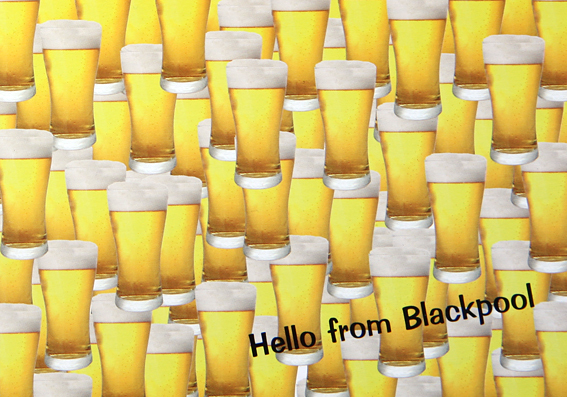 Today Blackpool’s economy remains relatively undiversified, and firmly rooted in the tourism sector. It’s a favourite location for hen and stag weekends and is Britain’s second most popular tourist attraction (over 6 million visitors a year) and was only recently knocked off the top spot by the British Museum. This entry was posted on Saturday, July 26th, 2008 at 2:17 pm	and is filed under PLACES, POSTCARDS. You can follow any responses to this entry through the RSS 2.0 feed. Both comments and pings are currently closed.